Freshmen from Ms. Lavin’s Global classes and Mrs. Klarman’s English class took a trip on March 7th to Columbia University where they viewed a live performance of the play Romeo and Juliet. The production was put on by Columbia students in their last year of study and the play, affiliated with Columbia University School of the Arts, featured numerous modifications. The Theater at Schapiro Center, located at 605 West 115th Street, between Broadway and Riverside in Manhattan, was small and intimate with a cast made up of students from the acting classes at the University. Edison students were able to see the play very up close and personal. The cast used this to their advantage, making it a point to interact with their audience periodically. Costumes were straight-forward and kept simple; the Capulets wore white while the Montagues wore blues and greens. Various roles were gender-bent, such as Mercutio and Tybalt, who traditionally are played by men, but in this case, were played by females. 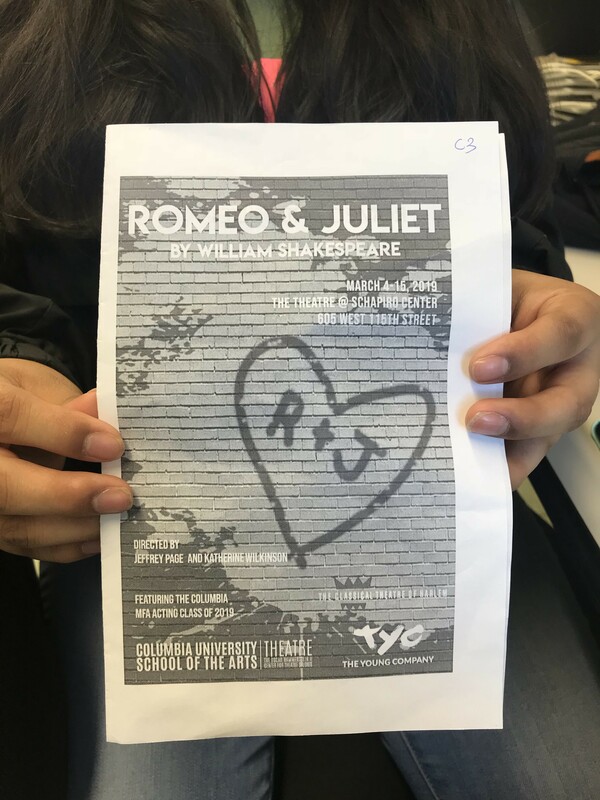 Classic roles, like Romeo’s parents, the Prince, and even Paris, were excluded from the play, but that didn’t hinder our students from enjoying the show. Music impacted the overall performance greatly. All through the acts, the sounds of guitar and beating time could be heard. Throughout the performance only two props were used, both being chairs. They were pushed together and opened like doors, used as actual chairs, and at one point even used to portray Juliet’s balcony. The cast stood on them, sat on them, even laid underneath them. The production, yet minimalistic, was fantastic and peaked the interests of many students at Edison. Hi! My name is Amanda Bisember and I will primarily be writing for General News as a part of The Edison Light. My interests include reading, running, sleeping and hanging out with my friends. I hope that you enjoy reading my articles and that they help you become a more well informed person.